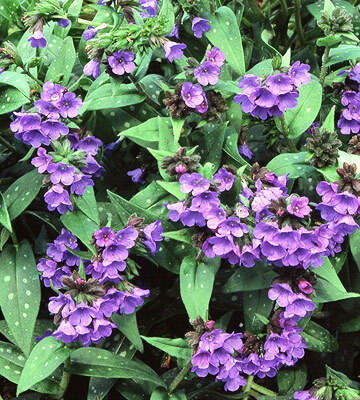 Description: In early spring, the brilliant blue, pink, or white flowers of lungwort bloom despite the coldest chill. The rough basal leaves, spotted or plain, always please and continue to be handsome through the season and into winter. 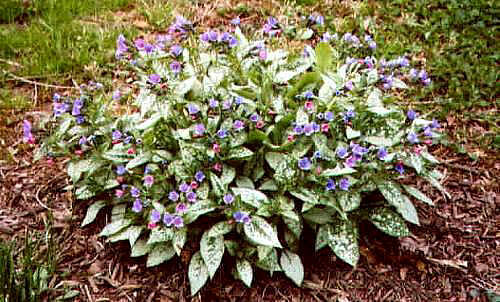 Planted close as a weed-discouraging groundcover, or in borders as edgings or bright accent plants, lungworts are workhorses and retain their good looks. Tips: Want to know what to plant it with? Check out this great list! I just discovered this plant online today. It's beautiful! I'm hoping I can find it at a local nursery. I want to pair it with some hostas that I already have. I'll gladly take your hostas from you amber!